by KN5G - Hope everyone had a great Memorial Day weekend and didn’t over indulge with too much good food or get too much sun! As most of you already know our Henderson repeater is experiencing some technical problems. We believe it is due to an issue in the feed line or the connection between the feed line and the antenna on top of the water tower. The repeater, cavities and jumpers in the shack below the water tower have all been checked out a couple of times without an issue being found. 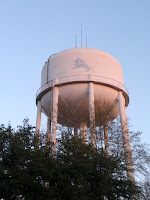 Of course the access to the radio shack below the water tower is limited due to Homeland Security Regulations regarding public water supplies so it isn’t easy to gain access when the repeater is acting up. Also it isn’t easy to find someone with the required insurance to climb the tower and check on the feed line or connection to the antenna. Having discussed all the above issues during recent club meetings, we have decided our best course of action is to see if we can find a new location for the repeater where access will be a little easier to gain. Locations on desirable towers are very hard to come by now days. After checking with the owners of several of the more desirable communications towers in the area we have decided to go to plan “B”. Richard is checking on a 100 foot tower near the current repeater site to see if we can get permission to move the repeater there. The height of this tower is somewhat lower than the water tower so we realize we will be giving up some coverage due to the lower height of the antenna. Our hope is that even with some reduced coverage, the repeater performance will be more dependable and encourage more participation by local amateur operators. A local repeater is the gathering place for all the local Amateur Radio Operators and gives everyone a place to communicate with each other and stay up to date on the happenings in the area. Also any emergency communications in the local area needs to have a reliable repeater that can be counted on. We would do well to remember that other non-amateur citizens often listen to the communications over the local Ham repeater to stay informed about emergency situations, especially severe weather events. Just one more reason why we need to maintain our local repeater in the best operating order as possible. Hopefully within the next week or two we will know about our options of moving the repeater to the 100 foot tower and proceed with that plan. In the mean time, if you know of any other locations or know of any tower owners that may be “Amateur Radio Friendly”, do not hesitate to visit with them and see if they might be willing to let us relocate the repeater to their site. We’ll try to post timely updates on the repeater status here on the website as they become available.